Environmental Protection Agency chief Scott Pruitt, who either denies climate change or thinks it might be good, actually depending on how he feels that day, has done his very best to decimate the agency’s ranks at the same time he’s spent hundreds of thousands in taxpayer money on elaborate security measures like 24-hour guards and biometric office locks. Now, per the New Hampshire Union Leader, Pruitt has an explanation for the $90,000-plus he spent flying on largely-first class seats in June 2017. It’s that people hate him so much he requires extra security, lest randos jump him in coach or whatever. 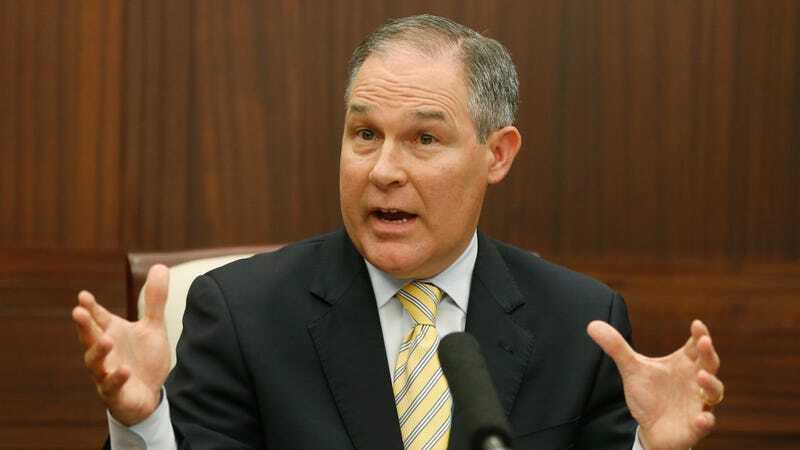 More threats than his predecessors may not exactly be a Code Red situation, though, as prior agency chiefs did not request anywhere near the same level of security as Pruitt. Former EPA administrator Christine Todd Whitman, a vocal Pruitt critic herself controversial from her tenure under President George W. Bush, told CNN that she felt no need to install elaborate security systems in her office and that cleaning staff could enter and exit with no restrictions. In any case, perhaps the reason the EPA is suddenly attracting so much negative publicity over the course of the past year is things like Pruitt suggesting that it would be “arrogant” for humans to predict what temperatures are ideal for the continued survival of the species at the turn of the century, or his efforts to deregulate major polluters, or raise radiation safety limits, and various stuff of that nature. Not sure it says that in How to Make Friends and Influence People, though hey, there’s a lot of reading Pruitt should probably catch up on.